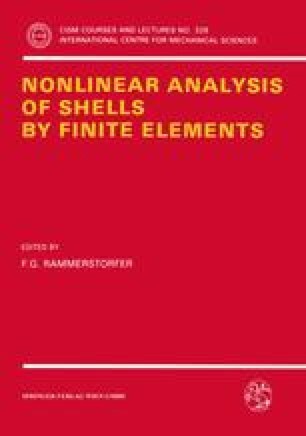 This chapter deals with the non linear analysis of concrete shells using the finite element method. The finite element formulation is based on small displacements Reissner-Mindlin facet shell theory. Shear locking in dealt with by using an assumed shear strain approach. A layered model is used to take into account material non linearities in the plain concrete and the reinforcing steel over the shell thickness. A constitutive model for concrete based on plastic damage theory including stiffness degradation effects is presented. Details of the general non linear finite element solution are also given. A full section is devoted to the treatment of beam stiffeners using simple two noded layered Timoshenko beam elements and an example of this formulation to the analysis of a slab-beam bridge is also presented. The last section includes a number of examples of application of the finite element method to the non linear analysis of different plain and reinforced concrete shell-type structures like a deep beam, a slab-beam bridge, a cylindrical shell and a cryogenic concrete tank for storage of liquid gas.